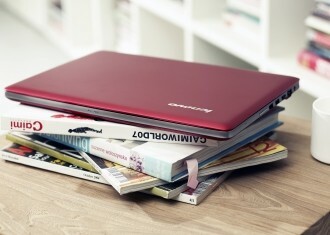 Lenovo has launched two new IdeaPads that have met Intel qualifications to be deemed Ultrabooks. The 13.3-inch IdeaPad U310 and the 14-inch U410 both ship with third generation Intel Ivy Bridge processors that offer more processing power than Sandy Bridge components while touting longer battery life and lower operating temperatures. The smaller U310 starts at $749 which includes a Core i3 processor, a 32GB SSD used for cache and a 320GB hard drive. Standard features include a 13.3-inch display operating at 1366 x 768, stereo speakers, USB 2.0 and 3.0 connectivity, HDMI-out, Intel Wireless Display technology and 802.11n Wi-Fi. Users can expect up to seven hours of battery life from the U310, a system that measures just 0.7-inches thick and weighs 3.74 pounds. Of course, if a Core i3 isn’t enough to suit your needs, there are provisions for a Core i5 and Core i7 upgrade in addition to storage of up to 500GB. The U410, measuring in at 0.83-inches thick and 4.18 pounds, is good for up to nine hours of battery life. Starting at $799, this 14-inch Ultrabook uses the same Ivy Bridge processors as the U310 but upgrades have been made in the memory and storage departments; up to 8GB of RAM and a 1TB hard drive are now on tap. This beefier system also includes Nvidia GeForce 610M 1GB graphics, an upgrade from the Intel GMA 3000 HD graphics on the U310. Both systems are available starting today in select countries and will be available on Lenovo’s website sometime this week. Expect to see these Ultrabooks on store shelves in China, Germany, India, Japan, Russia, the US and the UK later this month.